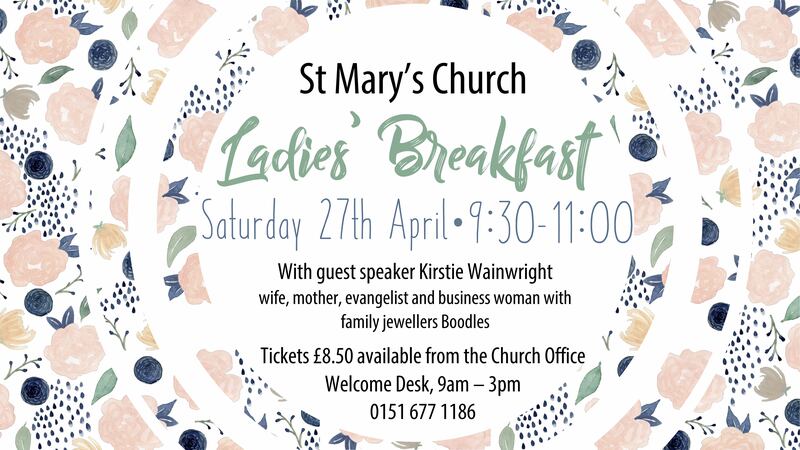 We’re delighted to be hosting guest speaker Kirstie Wainwright on April 27th for our Ladies’ Breakfast so bring your friends along – it’s going to be a brilliant morning. Full details on the flyer below. An event for anyone exploring faith – a delicious breakfast in great company and the opportunity todiscover more and ask questions in a relaxed and welcoming environment. Tickets £8.50 available from the Welcome Desk in the new St Mary’s building. It is possible to reserve tickets, but we’re asking that all tickets are paid for by 20th April latest. Any tickets not paid for by 20th April will be released for others to buy. If you have any questions or queries, please get in touch with the church office. If you are a member of the Centre congregation, Fiona Williams will organise tickets, please contact Fiona.